For undergraduate courses in Adulthood and Aging, Gerontology, and Adult Development. This best-selling book discusses the aspects of "successful aging," covering growth and development from young adulthood to old age, and the impact that culture, gender, ethnicity, and individual differences have on these processes. 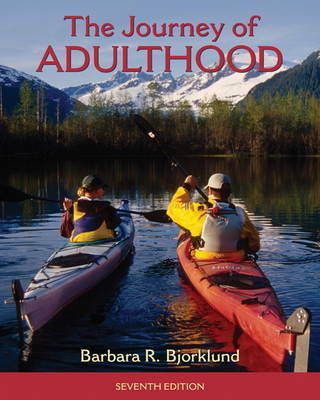 For Barbara Bjorklund, the subject matter in Journey of Adulthood 6e has never been far from home: as a middle-aged adult who is on this very journey along with her husband, looking ahead toward their parents who are in late adulthood and back toward their children who are making their own way through adulthood, she has found that there is always room to learn - always room to grow. One of the major goals of this text is to capture this dynamic process of adult development from young adulthood to the end of life. Its core is made up of research findings from large-scale projects and major theories of adult development, but it also reflects smaller studies of diverse groups, showing the influences of gender, culture, ethnicity, race, and socioeconomic background on this journey. Combined, this material creates for an exciting and thorough view on the process of "successful aging."